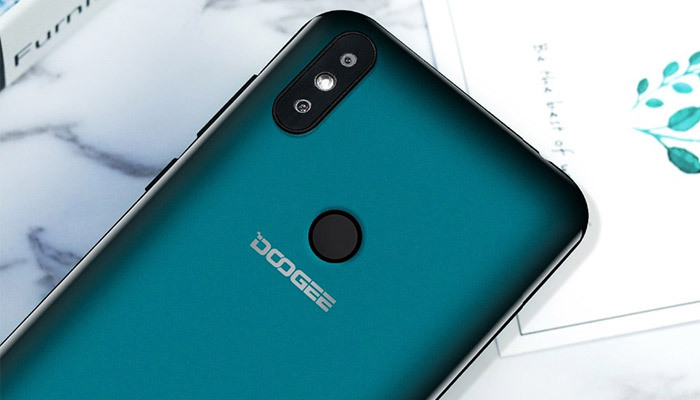 The Doogee Y8 blows the budget competition out of the water! Yes! 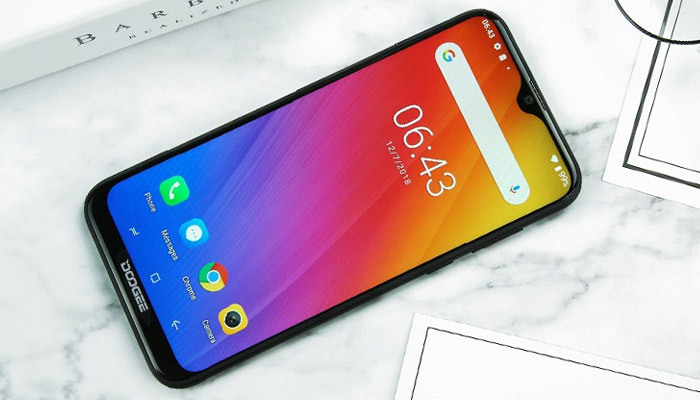 Finally we have a super-budget smartphone that features 2019’s teardrop notch display, and more importantly, doesn’t skimp out on the 4G (like the also super-affordable Blackview A60 and Cubot R15). With Android 9 Pie pre-installed from the get-go, a healthy 3400mAh battery and the aforementioned 6.1″ teardrop display: the Doogee Y8 might just be the best value Android phone this year! It’s hard to believe that you can bag yourself the all this for only £74.99. And that’s the local Amazon price; you can knock off another £10-15 if you’re savvy enough to import from one from overseas. While it may be looking very positive for the Y8 so far… there are a couple of dubious hardware choices to consider. So stay with us as we cover the pros & cons of the Y8’s display, performance, connectivity, battery life and dual-cameras. And finally finishing off with whether the Y8 is the right for smartphone for your budget. As always, if you have any questions? Leave a comment for our team at the end of this review. When you’re shopping for a phone in the sub 100 price-range, we’ll have to take lightning-fast response times off your wish-list. It’s more important that the phone is reliable, has a healthy battery life and also a crisp & bright display. Luckily the Y8 doesn’t disappoint on any of these three key features. While the 1280×600 resolution only gives the Doogee Y8 a mediocre PPI of 231, don’t let this put you off. 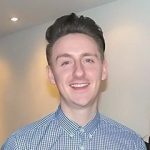 PPI isn’t everything with colour balance and brightness also being significant factors when it comes to measuring display quality. 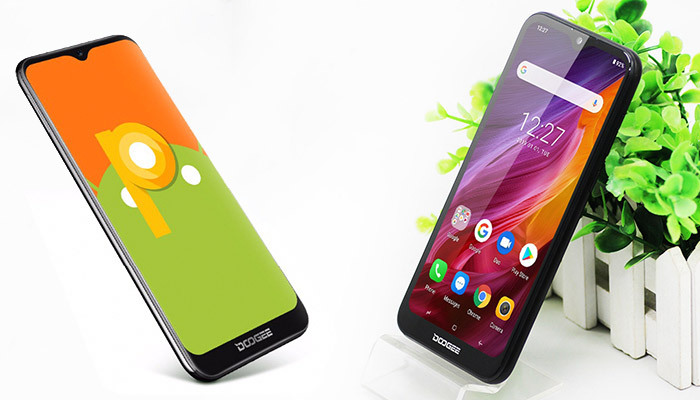 The Doogee Y8 offers just under 400nits of brightness making the colours pop indoors while still being visible even in bright sunlight. Thanks to the lightweight 150g body, the Y8 also feels great in your hand. Everything on this phones curves, the 2.5D glass, the curved display corners, the curved metal frame and curved battery cover. While definitely not premium, it’s way better holding a smooth plastic pebble phone than a clunky plastic box phone. Finally onto the performance; The quad-core MediaTek MT6739 we find in the Y8 first made its way into budget phones a year ago. It’s the same processor we saw in the Elephone A4 and more recently the UMiDigi A3. While not one of MediaTek’s performance Helio chips, the MT6739 still offers solid performance for light-Android users. This means that if you spend the majority of your time on social media, browsing the internet and watching YouTube, then you’re a light user. If on the other hand, you want to play the latest 3D games then you’re out of look. You’ll need a much more powerful mobile chipset. Multitasking on the Doogee Y8 benefits from the generous 3GB’s of RAM, making switching between apps responsive and it also helps by keeping those background updates, well, in the background. Overall, when considering the uber-low starting price on the Doogee Y8, it scores highly across the board when looking at the display, performance & design. Unlike a lot of budget smartphones we get our hands-on here at Review Hub, the Doogee Y8 actually has a functional dual camera setup. The 2nd lens comes in at 5 megapixels, adding a subtle depth effect to your photos. Together the 8MP + 5MP rear camera setup works well, capturing photos indoors and outdoors clearly. Images do tend to look a little soft though. Also, photos lean towards a natural colour profile which might seem dull when compared to the oversaturated colour profile most phones now use. Video also comes in at 720P @ 30fps but suffers a lot from shakiness and lens wobble. 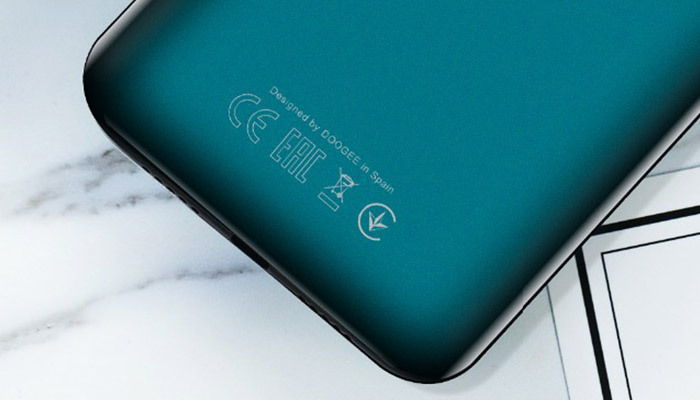 Inside the Doogee Y8, we are treated to a (non-removable) 3400mAh battery. The 3400mAh easily lasted a full days usage during testing and will see light users well into their second day without charging. This is partly thanks to the lower resolution display of the Y8 and also the lower-powered quad-core CPU we mentioned earlier. It’s not all good news though as the Y8 misses out on any kind of fast charge with only 1amp charging supported. So charging this phone takes hours, literally. 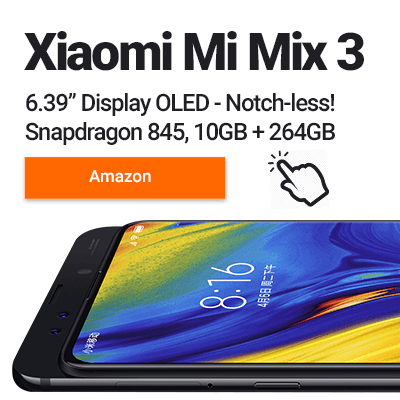 You’d be hard-pressed to find a smartphone that offers the same lightweight design, a teardrop display (albeit with big bezels) and 3GB RAM + Android 9 Pie…. all for under £75 delivered locally to your door from Amazon. 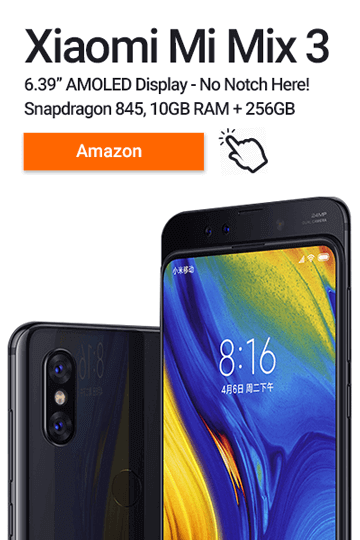 If you’re ordering from overseas, you can even grab the Doogee Y8 for as little as 79 USD or 70 EUR, but beware that you might have to add import duty costs on top of this. Do we recommend the Doogee Y8? Absolutely, it’s one of the best value budget phones to be released in 2019. 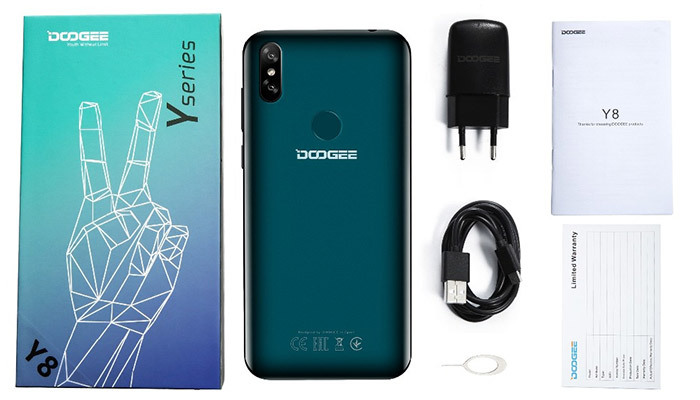 Inside the Doogee Y8’s box, you’ll find a standard USB to Micro-USB Cable, Doogee Warranty Card, Quick Start Guide, SIM Pin and a standard EU 2-Pin Charger. Previous articleCubot R15 – Teardrop Displays For Everyone!